Micro-roasted Coffee and Espresso produced in small batches. Micro roasting is part of an effort to have coffee recognized for its merits as a gourmet product. Pricing: 8 oz Bag - $10.00, 12 oz Bag - $15.00, 20 oz Bag - $19.00. Holiday Mix or Match 3.25 oz of any Coffee: 1 Bag -$5.00, 2 Bags -$9.50, 4 Bags - $16.75, 6 Bags - $25.00. Mint, & New York Style. Pricing: Mix & Match - 1 Bag $4.00, 2 Bags $7.50, 3 Bags $11.25, 4 Bags $15.00, & 5 Bags - $19.50. Pour-over Coffee Maker. Price: $8.99 to $32.99 based on model. Receive a free bag of 3.25 oz coffee with each Pour-over Coffee Maker purchase. French Press. Price: $8.99 to $45.99 based on the model. Free bag of your choice of coffee with a purchase of a French Press. Loose Leaf Tea Pots. Price: $12.99 to $30.99 based on model. Locally-made jewelry by Elements of Earth. Prices range from $10.99 to $25.00. Burlap Primitive Prints. Prices range from $45.99 to $150.00. 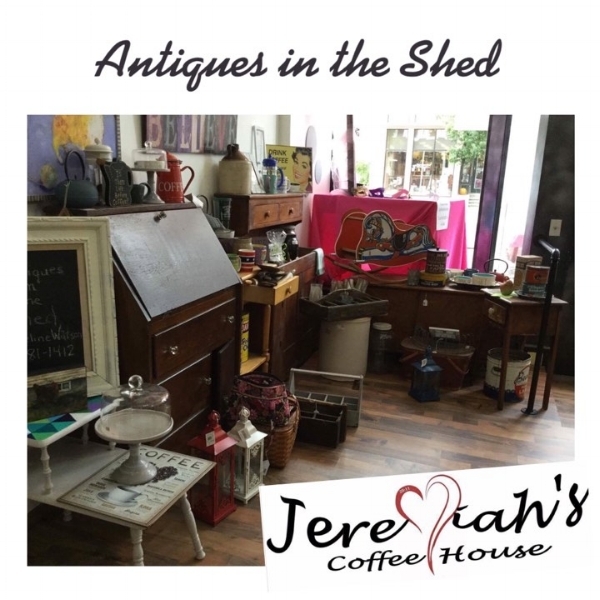 Variety of antique pieces from Antiques in the Shed. Prices range from $10.00 to $450.00. 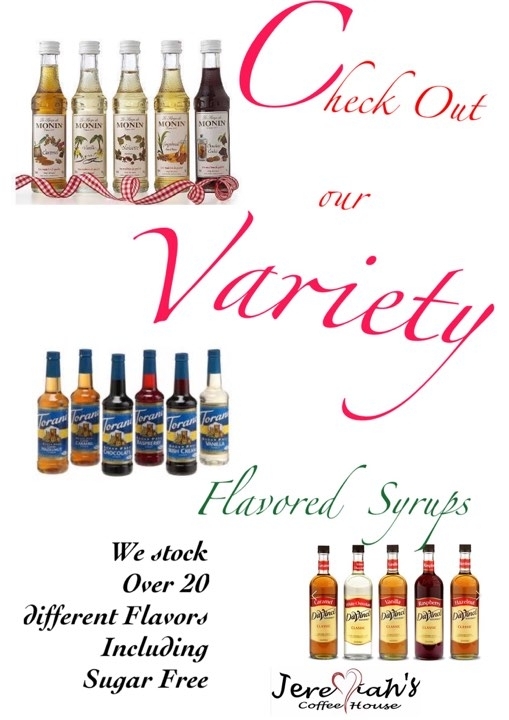 Flavored syrups. Price: $10.00 each. Buy 3, get 4th one 50% off. Buy 6, get 6th one free. Featured pieces by Brick Street Cottage, ranging in type. Price $5.00 to $250.00 per item.